Some of our regular readers might remember when we did the Wild Cave Tour at Kentucky's Mammoth Caves over three years ago. It was a pretty strenuous exercise, and we weren't sure if this would be the same. Turns out that this was a lot less "wild", but still fun nonetheless! 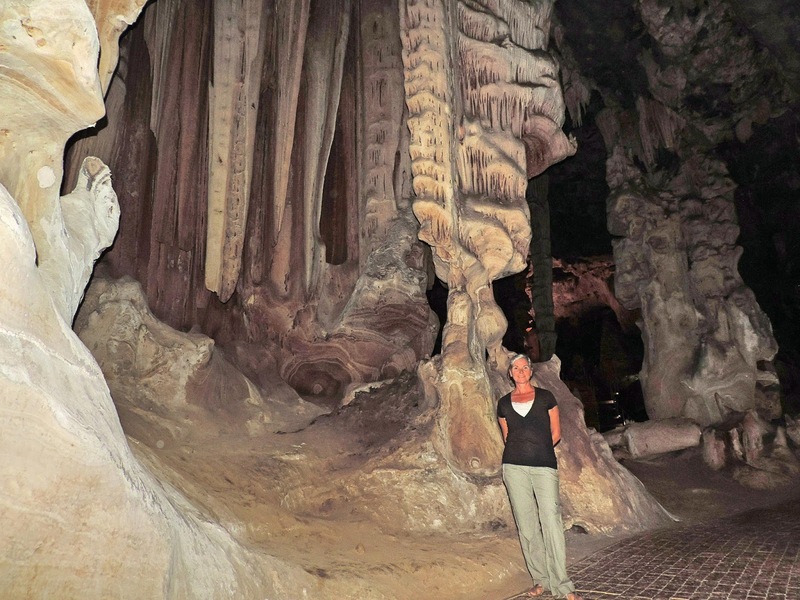 Cango Caves is located only 25 kms (15.5 miles) north of the small city of Oudtshoorn. It's really scenic countryside with rolling hills and farmer's fields. Along the way to Cango Caves. We didn't have reservations, and we showed up fairly late in the morning so we thought it might be busy. Turned out that we got there just in time for the 11:30am tour and it was a reasonably sized group of 14 people. Our tour guide took us into the first section where he had a little talk with us, explaining what we were in for. They don't have near as many rules and regulations here as they did at Mammoth Caves. Here, it's up to you to decide if you're of the right size to fit through the small openings! You are responsible for your own decisions in life. What a concept! He said that a few years ago, they had one "huge" woman who was adamant that she would fit. Sure enough, she got stuck and looked for someone to blame. It took them 11 hours to get her out. Problem was, she was the second last person to go through and the rest of her group was stuck on the other side for 11 hours! We all laughed, but I noticed that several people looked around to make sure there weren't any "huge" people in our group! The regular tour costs R80 ($8.40) and the Adventure tour is only R100 ($10.50). And you get to see everything that the regular tour goers see as well. Great pricing, but keeping in mind that this tour is only an hour and a half long compared to the six hours we spent in Mammoth Cave for $48. The main cave room. Just as we were leaving with our small group, this large group came through. Glad we didn't have to do it with that many people! Ruth and some of the cave formations. 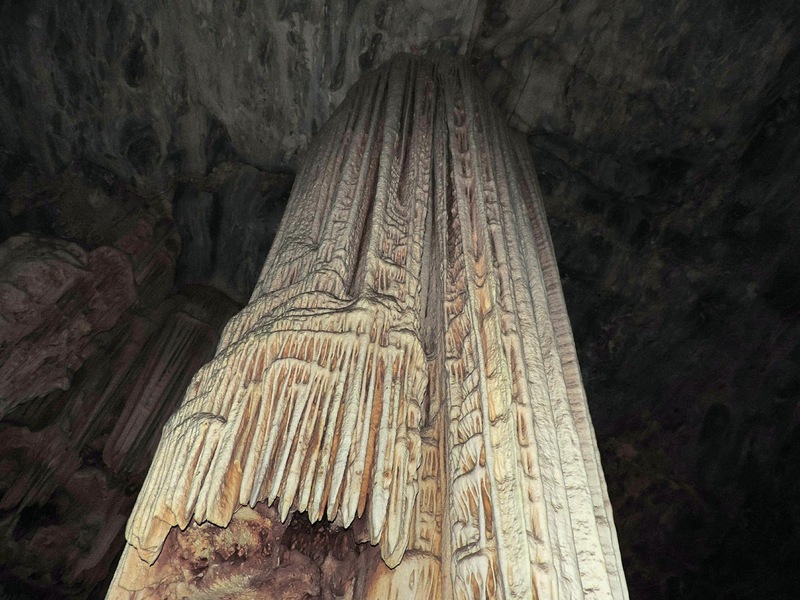 They said that this pillar took 200,000 years to form. 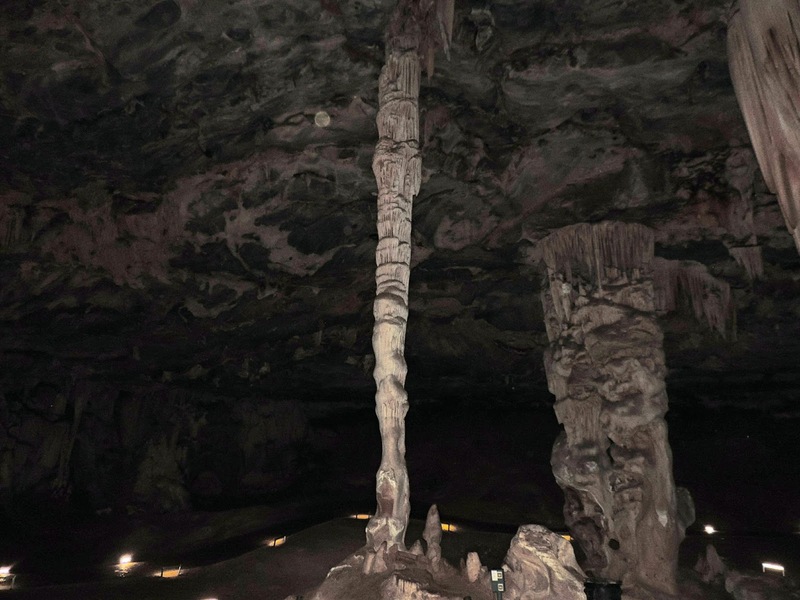 We've been to a lot of caves, but Cango Caves has some of the neatest formations we've ever seen! 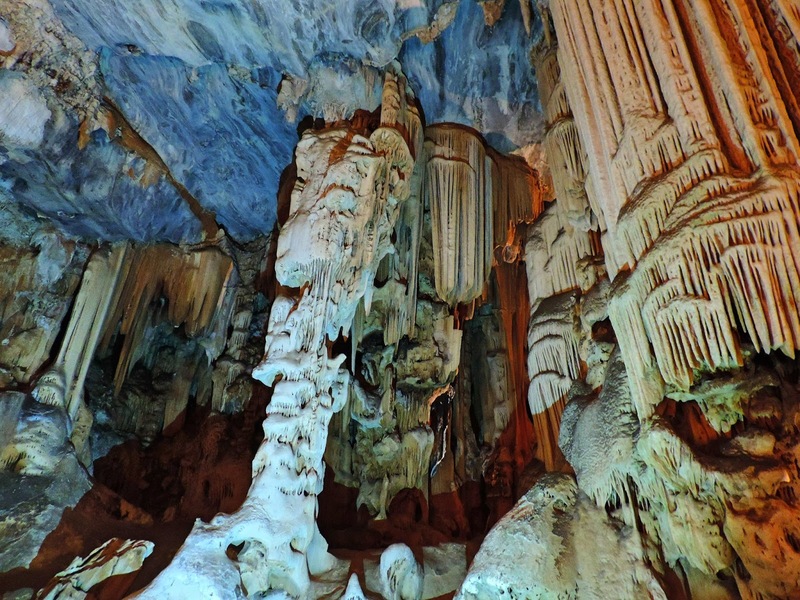 These are natural colors with the bluish limestone roof and then the mineral deposits making up the formations. the Devil's Chimney was pretty tight!! Heading in to "the postbox"! And into the postbox below! Great fun. Not nearly as technical or as basic as the one we did at Mammoth, but still a good hour and a half tour.We did this one in sandals, and I was wearing shorts as well. Got a couple of scratches on one knee, but not at all like the Mammoth one where we had to wear coveralls and helmets and head lights. From the caves, we had seen a sign to a waterfall and found out that it was 11 kms down a partial dirt road. We decided to go for it, since it was a beautiful day. 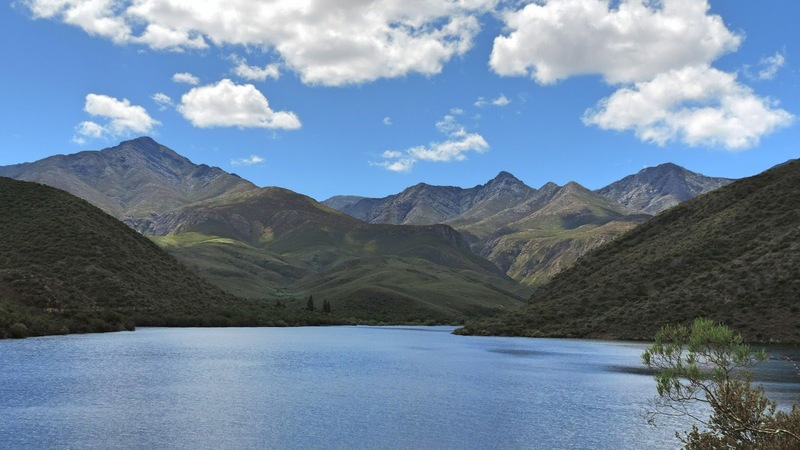 On the way to the waterfall was a beautiful lake formed by the Koos Raubenheimer Dam. We spotted another big tortoise near the side of the road. We paid R42 ($4.41) for the two of us to park and walk the 300m to the waterfall. No, this little waterfall was not the main event! But this one was! 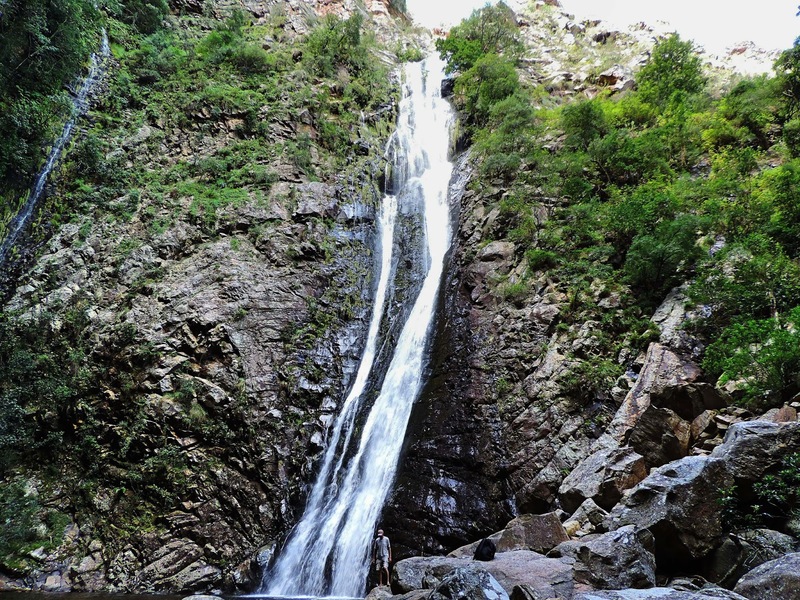 Can you see Kevin standing at the bottom of the Rust en Vrede Waterfall? Yes, Kevin has a sandal tan. For those of you in colder climates right now, having a sandal tan is far better than having no tan at all! Great pictures of the cave and waterfall. More great sightseeing adventures, and some awesome photos. We love caves and we love waterfalls so yes, it was another great day of adventures! It sure was a fantastic day! Another beautiful place! Great pictures. It's not hard to find so many beautiful places here, it seems that just about everyday we say "wow" about something we see. Now that's our kind of office - you two look so comfy at "work!" It was wonderful sitting out there "working" with a nice breeze and nice sounds all around us. Thank you Barbara for your wonderful words. Namibia is somewhat like what we expected to see in Africa and we loved every minute of it but South Africa is so totally different. Again, we knew what to expect in Lesotho but we were still overwhelmed by it's beauty. We would jump at the chance to go back there as we only saw a small portion of this amazing country. Oh boy. Looks a little tight in some of those spots. I *guess* I would do it. Not sure. We've been in the caves in Puerto Rico and Slovenia, but that's it. The ones in Slovenia were where you weren't allowed to use flash photography. Something to do with the little critters on the walls. I came real close to turfing a couple tourists over the side. Figured a Slovenian judge would have let me off. Yep, there were a couple of really tight spots but there was a big guy in front of us that was a firefighter and he had big shoulders and lots of muscle so I knew if he could make it through then we weren't going to have a problem. We have come across a few tourists like that, we end up just shaking our heads and wondering if they just can't read or understand that a picture of a camera with the flash going off inside a red circle with a line through it means no flash photography! Great views, and animals too! Our first hike in Lesotho! Not long enough in Durban! Arrived in the city of Durban! How many cows did you pay for your wife?